myViolet.com is part of our goal to develop new exciting tools for anyone who loves African Violets. We created this site to be a multi-dimensional resource that is truly functional for people with any range of experience in growing African Violets, from novice to expert. 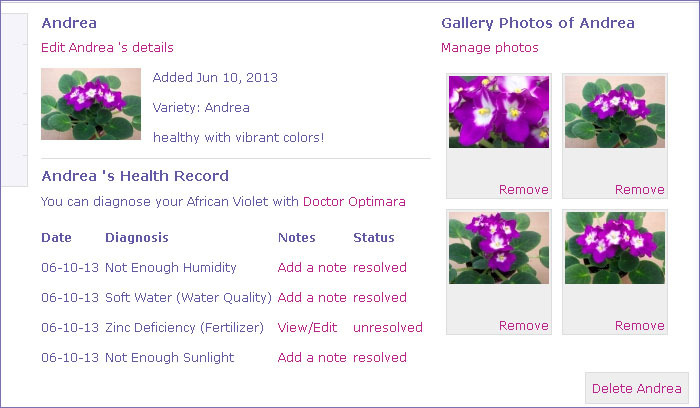 Create a profile and health record for each of your African Violets. Our care instructions will help you to keep them blooming and vibrant. You can save notes about the plant attched to your photos Plus keep track of changes, seasonal health issues and more. You can create profiles for an unlimited number of violets. Create a separate photo gallery for each violet and watch it grow. 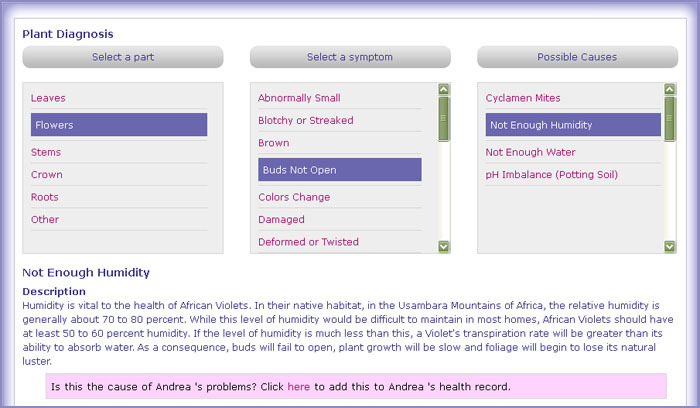 Each violet can be given a detailed health record using the Doctor Optimara diagnosis tool. If you have a problem with your violets you'll have a full record of what worked to resolve it. Any diagnosis can be saved to the violet's proifle along with user notes. Doctor Optimara is a dynamic tool that allows you to input combinations of symptoms in order to diagnose any African Violet problems or pests. At each step, you can view the entire list of problems which may cause the symptoms you have indicated to that point. When the diagnosis is complete, you will be provided with a complete description of the problem, along with recommended treatment and prevention options. Area Delivery Notifications: Fresh Violets When YOU Want them! Get your African Violets fresh when they arrive at the store or nursery. We heard your feedback and are aware that African Violets have a rough time surviving for long in a retail environment. Now we have developed a zip-code based alert system for our fresh violet shipments! 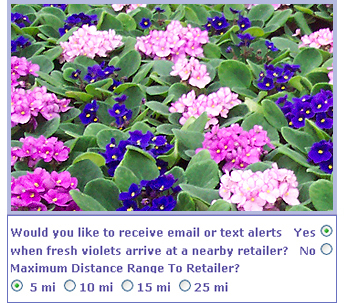 When you sign up on myViolet.com and select "Email Alerrts", you can select a range of 5, 10, 15 or 25 miles from your zip code, each time fresh violets are sent to a retailer in that area you'll get an alert with the shipment date and the name(s) & location(s) of Optimara African Violet retail distributors (Lowe's, Home Depot, Local Nurseries, etc). Turn alerts on or off anytime with the click of a button! Once you have enough beautiful violets for now, this feature is easy to turn ON and OFF. At the bottom of each message is a link to "Unsubscribe" which will turn off Alerts until you decide go back to your myViolet profile and turn them on again. Browse the varieties section to see named varieties of our current and past cultivars. Doctor Optimara To Keep Your African Violet In Top Health.